Well, we came, we saw and we got home safely from our 11 day flit through some of New South Wales. My 2nd lad and my daughter came along in his old Holden Rodeo and I took the DR.
We had a ball! Although we did not do all we wanted and get to all the places, we did most of it. I've made a video Ride Report instead of the conventional photo and write up style so I hope you all find it somewhat interesting. LOL! If you only lasted 4 mnutes it must be a crap video! LOL! If you only lasted 4 minutes it must be a crap video! Naw, naw, naw.....that was just after the first 4 mins!! Getting back into it lateron, there's just so much great stuff posted at the moment and I got hung up on Ant's yarn. Didn't even get around to post more NZ stuff, despite all the pics being upped, ready to link. Ha ha, there is a lot of cool stuff kicking around, I agree. It was also pretty crap of me to chuck a video up and go "Watch this yarn, boys" with out some background info, I have an excuse although I won't use it!! Anyway, now that I have more time, we did a loop from Adelaide into NSW as far north and east as we could manage and get back again in 10-11 days. We travelled 3759 km, visited Mudgee Observatory, the Bathurst Racetrack, the Dish in Parkes and camped every night in tents and swags. As we didn't know too many camp spots we stayed in caravan parks mostly although we had 3 good nights camping in the wild and sitting round a nice camp fire. 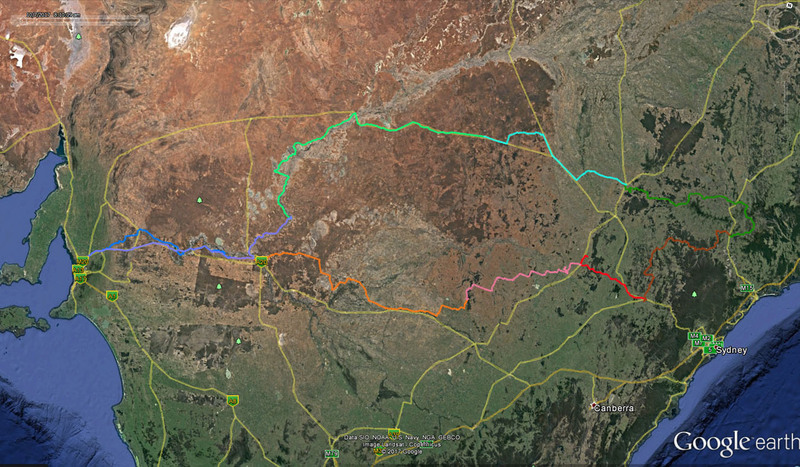 Here is a bit of a map of our route, glad to swap GPS tracks if anyone is interested.